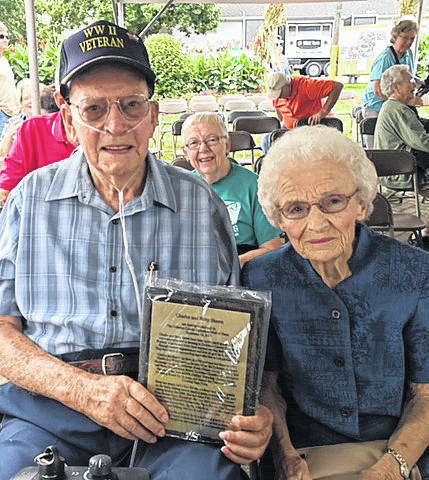 Charles and Betty Sheets were inducted into the Delaware County Agricultural Hall of Fame during this year’s fair. The Sheets proudly display the plaque they received during their recognition and induction. During the 2017 Delaware County Fair, Charles and Betty Sheets were inducted into the Agricultural Hall of Fame. The Sheets’ interest in preservation can be seen in the new Brown Township hall. In the foyer of the facility is a wall showcasing their family history in the Kilbourne area from 1834 to the present time. The Sheets donated $1.1 million to have the new hall constructed on the old Kilbourne School site. Betty Sheets graduated in 1949 from Willis High School in Delaware. Charles Sheets said he purchased the land at 2918 Steamtown Road, Delaware, in 1950 where he and Betty still live. According to Skinner, the two were married on October 21, 1951, raised two children and have three grandchildren. Skinner said the Sheets have enjoyed serving the community through various organizations and they love to give back to others. Highlights from Charles Sheets’ long list of activities over the years include serving in the Army from February 1945 to November 1946; getting legislation started and passed on House Bill 25, protection of farm drainage systems from rural development, and signed into law by Gov. Bob Taft; 41-year member of the Masonic Lodge; director of Delaware Farmers Exchange; director of the Delaware Rural Electric Cooperative; Oxford Township Trustee; and 73-year member of the K of P Lodge. He was instrumental in starting the Delaware County Railroad Crossing Task Force and served as chairman since it was organized in 1998. Highlights from Betty Sheets’ list, as long and impressive as Charles’, include being honored as the Delaware County Farm Bureau Farm Woman of the Year 2001; member of the Farm Bureau; lifetime member of Delaware Historical Society; 55-year member of Ashley Progressive Mother’s Club; member of Delaware Genealogical Society; member of the Kilbourne Grange from 1948 until it closed in 1970; supported the Farm Bureau Women’s Committees, Farm Bureau Fun Tent at the Delaware County Fair, Ag Day breakfasts, Ag in the Classroom; member of Delaware Genealogical Society; and served on the Farm Bureau board of trustees. “Betty loves to bake cookies and give them to the mailman, paper carrier or whoever might come to visit,” Skinner said. The Sheets were recommended for the Hall of Fame by the Skinner family and Hardscrabble Farms Inc.